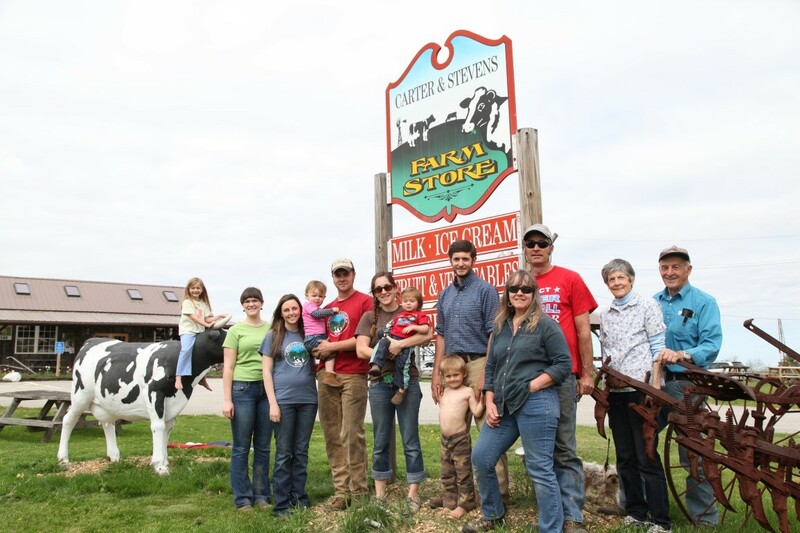 The Carter and Stevens Farm was established in 1938, when Donald Carter purchased the Allen Farm in Barre, MA and began milking cows under a tent. Five generations later, the farm continues to produce milk of excellent quality. The farm currently has the largest acreage of pasture in the state, producing exceptional feed for the milk producers. Donald Carter’s daughter Audrey, married Daniel Stevens in 1954, and Dan joined Donald in the dairy business. Dan and Audrey’s son Philip and his wife Erin purchased the farm from them in 1988. The farm has now grown to 1000 acres, and the business is an LLC managed by Philip, and two of his children; Molly DuBois and Will Stevens. The farm’s dairy operation has grown and changed over the years. The first barn built in 1938 was a “state of the art” Gambrel style stantion barn with a hay trolley. In 1962, one of the first milking parlors in the state was built here. It milked 8 cows. In 2012, a new 20 stall dairy parlor was built, alongside an impressive 200ft. pack barn and manure facility. The buildings are powered by solar panels and a wind turbine. Their current milking herd is 110 cows, and the herd average is 18,000 lbs. They harvest 130 acres of corn and 400 acres of hay/silage. Carter and Stevens Farm has continued to survive economically due to innovation and diversification. In 2005, using a 1700’s post and beam frame they rescued from demolition, they built and opened a farm store. The store features their own raw milk, ice cream, vegetables, grass fed beef, maple syrup, homemade breads and pastries and local cheeses, beers and wines. The store has a daily lunch deli, serving sandwiches featuring locally produced ingredients. In July and August, Friday and Saturday nights are “Bar-B-Que Grill” nights. This Farm to Flame restaurant uses their own oak firewood on a hand built stone oven to grill their famous grass fed beef, and other BBQ favorites, complete with homemade baked beans and farm grown fresh vegetable sides. The farm store has become a popular attraction for families to enjoy farm animals, fresh air and fine foods, in the area. Carter and Stevens Farm sells firewood, hay and compost as well. They sponsor festivals during the year, such as the “Harvest Festival.” During these festivals there are opportunities for the general public to tour the farm and milking facility where they are educated about the importance of local agriculture. Last year, a special event was held at the farm called “Warrior Dash”. This running race attracted 10,000 participants, and many thousand spectators. It was a great opportunity to display the farm and farm store and increase the market area for the future. Carter and Stevens looks forward to hosting more special events. All these activities require lots of labor! Ten family members work year round to make it all happen. They hire up to 20 additional employees during the year. Carter and Stevens Farm is proud to preserve and protect open fields, pastures, and woodlands, and keep the farming tradition going strong in Barre, Massachusetts.